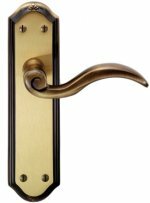 Our door handles are produced using accurate pressure die casting, and hot stamp forging methods to guarantee consistency in design and quality of finish. 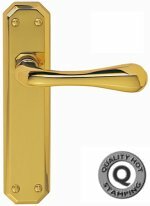 Premium quality Eden door handles produced in solid brass, supplied in pairs with follower bar and fixings. Door handle size 180 x 40mm. 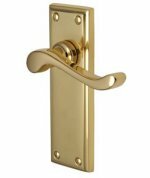 Solid brass contemporary Victorian door handles supplied in pairs with follower bar and fixings. 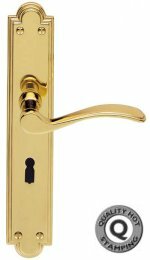 Door handle backplate size: lever lock & bathroom set 150mm x 43mm, lever latch & privacy set 118 x 43mm. 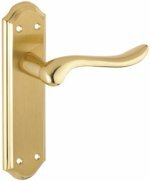 Premium quality Edwardian door handles produced in solid brass, supplied in pairs with follower bar and fixings. 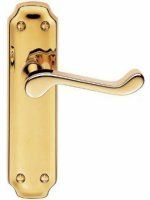 Door handle size 153 x 49mm. 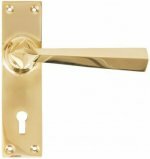 Available in Polished Brass, Antique Brass, Polished Chrome & Satin Nickel. 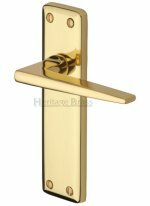 Premium quality Birkdale door handles produced in solid brass, supplied in pairs with follower bar and fixings. Door handle size 172mm x 45mm. 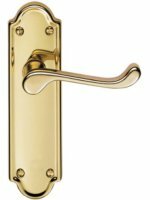 Solid brass Madrid door handles, supplied in pairs. Door handle size 180mm x 45mm. 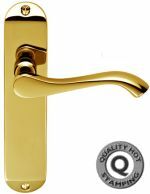 Premium quality Andros door handles produced in solid brass, supplied in pairs with follower bar and fixings. Back plate size 180mm x 40mm, lever length 115mm, projection 58mm. 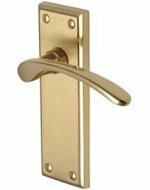 Solid brass St George door handles on backplate, supplied in pairs. 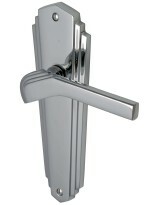 Door handle size 180mm x48mm. 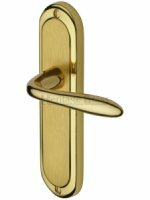 Solid brass shelbourne door handles, supplied in pairs. Avaialble on a long 248 x 48mm backplate or short 170 x 48mm backplate. 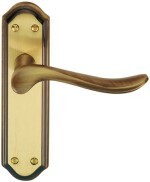 Picture shows the Long Lever Latch Handle. 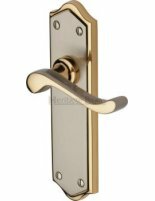 Dual Mayfair finish Henley door handles produced in solid brass, with a satin brass face and polished brass edge, supplied in pairs with follower bar and fixings. 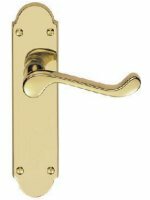 Door handle size 189mm x 48mm. 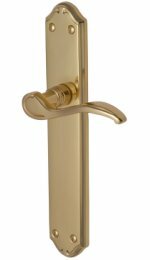 Verona long plate door handles produced in solid brass, supplied in pairs with follower bar and fixings. Door handle size 247 x 45mm. 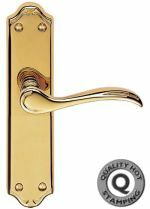 Available in Polished Brass, Polished Chrome & Satin Nickel. Backplate 152mm x 41mm, lever length 127mm. 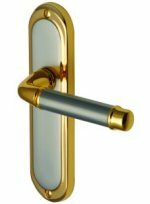 Available in Unlacquered Brass or Polished Chrome. 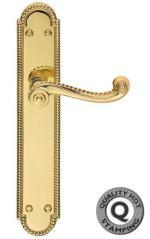 Solid brass St George door handles on long backplate, supplied in pairs. 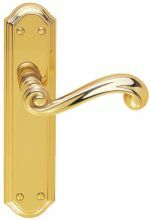 Door handle size 270mm x48mm. 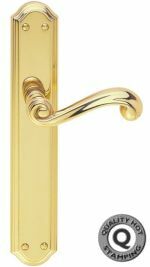 Solid brass Seville suite design door handles, supplied in pairs with follower bar and fixings. Door handle size 9 ½" x 1 ¾" (242mm x 44mm).